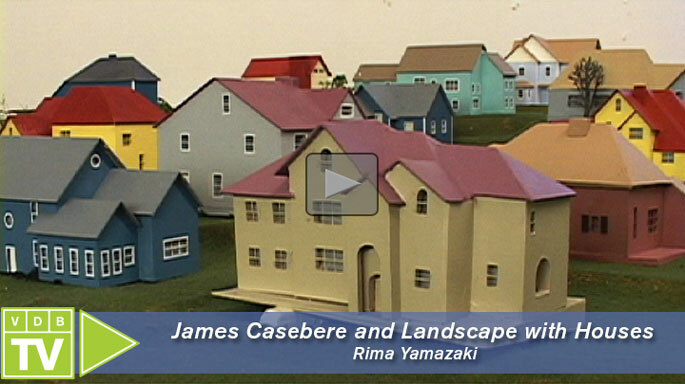 For this documentary, the filmmaker Rima Yamazaki visited the artist’s studio in Brooklyn on a regular basis, from the spring of 2009 to the fall of 2010, and documented the process of making the series titled Landscape with Houses, for which Casebere built his largest model to date. As the subprime mortgage crisis occurred, he became interested in American suburban neighborhoods, and started building a model of an American suburban landscape. Rima Yamazaki is an independent documentary filmmaker specializing in contemporary art and architecture. Her practice is an exploration of cinematic expression in documenting, studying and reflecting on the arts. She works as a one-person film crew; all her films are directed, photographed and edited by herself. Her films have been shown at various film festivals and venues internationally. She received a BA in Social Sciences from Hitotsubashi University (Japan) in 2005, and a BA in Film from Hunter College (NY) in 2008. She currently lives and works in New York. Video Data Bank has long been dedicated to the ongoing preservation of video works in the collection, and we have been working for a number of years towards the goal of full digitization of the archive. In September 2014, we welcomed archivist Kristin MacDonough as Digitization Specialist. During her tenure at VDB, Kristin’s work has been committed to the digitization project. Working with Archive and Collection Manager Tom Colley, Kristin maximized the efficiency of VDB’s ongoing efforts. Thanks to her project leadership, we are delighted to announce the digitization of the entire VDB collection. It was with a heavy heart that in September 2017 we bid Kristin adieu; however we take comfort in the fact that she won’t be traveling far — in November, Kristin becomes the first Time Based Media Conservation Fellow at the Art Institute of Chicago. Congratulations, Kristin! Tell us a little about your background, what inspired you to work in video preservation? I think I’ve always been interested in general concepts and principles surrounding preservation. I strongly considered archeology or art history research, but in exploring these paths, I realized they weren’t quite in the direction I wanted to go at the time. Somehow, and I don’t recall how, I heard about audiovisual preservation. The more I learned about it, the more I discovered that the balance between hands-on work and forward-thinking research was at the heart of my interest in preservation. Then during my graduate studies, those same interests led me to specialize in video preservation. The learning curve has been steep since I don’t consider myself an engineer, but I also believe this is knowledge that needs to be passed on to the archiving field since the number of engineers currently capable of handling Sony ½” open-reel decks or CRT televisions is low. Plus, it’s unlikely people entering engineering fields will need or want to learn about this equipment, so archivists will be the ones dealing with them now and in the future. What have you been working on during your time at VDB? When I started three years ago, I was hired to digitize the backlog of videotapes in the video art collection. Since the video collection includes tapes from the early 1970s to today, most of the tape masters are on either U-Matic (¾”) or Betacam SP, with a few Digibetas as well. I made suggestions for purchasing new equipment and set up two new digitization stations in order to digitize more U-Matic tapes where I could constantly monitor the process. After the first year, the project was extended to include the Videofreex Archive, a collection consisting of mostly original ½” open reel videotapes. Then in the third year, we made our services available to other departments across SAIC and digitized collections for them. During the three-year project, I digitized over 2,500 video and audiocassette tapes. What technical puzzles have you encountered during the Digitization Project and how did you overcome them? At times, every day of the week could feel like a technical puzzle. Format, machine, and software obsolescence are persistent concerns when digitizing video, and with that in mind, machines and software need to remain interoperable. Upgrading a Mac OS or changing out a machine in the equipment chain can affect the digitizing process. When changing a component, I had to be sure to track or document each step I made and be able to reverse my steps if they didn’t work out. The exposure to so much video art has really helped me understand the scope of work that is out in the world. We know artists make works for a variety of reasons, but there is almost always a message, whether it’s an aesthetic, a political, or social one. At the same time, it is hard for me to watch video art and not look for errors or unintentional video artifacts, but I also feel like I get to see beyond what the artist originally intended. You spent a great deal of time with the Videofreex collection. Would you tell me how you went about preserving and digitizing those tapes? About fifty percent of the work on the Videofreex collection was building a functioning playback environment. The ½” open reel machines came to us in various states of disrepair and deterioration. We acquired several ½” open reel playback machines, cleaned them, and with the help of a local engineer, Gary Chang, we were able to repair five decks and bring them to full working order. Along with Electronic Industries Association of Japan (EIAJ) standardized ½” black and white tapes, we are now able to digitize tapes recorded before 1970 (pre-video standardization) and tapes recorded in color. The other part of the work was stabilizing the media. Some of the tapes were not kept in the best storage conditions since they were recorded nearly fifty years ago. The tapes were cleaned with a custom built tape cleaner — which VDB commissioned — and then baked in a food dehydrator to temporarily stall the effects of deterioration so the tapes could be played. During the digitization process, tapes were monitored for technical errors to determine if those errors were recorded into the content or part of the playback/digitizing process. To determine this, multiple recordings were often made and compared side-by-side. It was important to remember that this was new technology at the time, and the Videofreex were still learning as they went along. Still, our goal was to capture the best image possible. Name some of your favorite video works from the collection and your reasons why. Some of my favorites are the early recordings from the Videofreex and the experimental works they made. The group documented political demonstrations in New York City and Washington D.C., including the 1971 May Day protests against the Vietnam War. The videomakers would record public service announcements (PSAs) from organizers, which they would show the other attendees later in the day. The content included information about staying safe while protesting, or how to talk to police if you’re detained. A step towards democratic social media, which seems as relevant today as it did in 1971. In some of the experimental work, such as Me’s and Youse and Mushwolf, they played around with superimposing faces in the video, which created a comical effect. In Pulsa, another experimental piece, they took advantage of the inherent image lag of a Portapak cathode ray tube, by setting up strobe lights in the yard at night and recording the lights turning on and off or moving around. The image lag creates an effect that makes the lights look like bright comet tails in the dark. With regards to the archive, I’m very proud of what we’ve accomplished. Digitization at VDB has helped the artists by making their works more technically accessible, and getting those works out into the world. The concept of “the Archive” has gained potency over recent years, particularly in the realms of art and culture. Depository of information, home for memory and data, source of inspiration and inquiry for artists and researchers — archives function in a multitude of ways across disciplines. For more than forty years, Video Data Bank (VDB) has served as a valuable resource for alternative video art histories, and has itself evolved into an “accidental” archive. VDB is a pioneer in fostering awareness and scholarship of media art — from a renowned anthology of early video art, to feminist and queer-focused curatorial projects, and media activist collections — long advocating for this most democratic and widely distributed of art forms. Can the archive be a progressive tool? How can the archive survive in the current political and financial climate? We are happy to welcome Josh MacPhee of Interference Archive as our keynote speaker, as well as representatives from organizations including: Black Film Center/Archive, Chicago Film Archives, Experimental Sound Studio, Media Burn, Public Collectors, Read/Write Library, School of the Art Institute of Chicago, Sixty Inches From Center, South Side Home Movie Project, and artist Joshua J. Kent.